The weather forecast this week seems just right for transplanting. Not only is it supposed to be warm at night, it's due to start raining at the end of the week, which will give transplants a leg up. Even the 10-day forecast shows no sign of freezes (which I take with a grain of salt since Sunday night was supposed to be 30 and instead dropped down to 23). That's good because, while onions, broccoli, and cabbage can handle temperatures in the upper twenties once they're established, it's nice to set the seedlings out when they won't have to deal with freezing until they've got their legs under them. The seedlings I started inside two and a half weeks ago are leggy and yellowed, despite their doses of manure tea (so they're not pictured). Hopefully, those inside starts will catch back up once they're in the ground, but I have a backup plan. 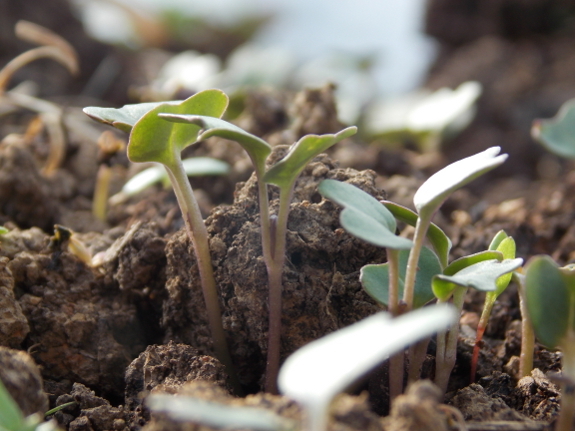 The babies under quick hoops are just now sprouting into hefty, healthy seedlings, which will be ready to fill any gaps in two or three weeks. This way we'll get the best of both worlds --- an early start on some seedlings and definite good health for others. Mark's mantra is "Backups, backups, backups!" and I'm always glad when I apply it to the garden. What a nice mantra! I can use it as a completely legitimate excuse for planting soooooooooo many seeds. I do have the notion of planting too many, partly for the sheer joy of seeing something the size of a punctuation mark developing into something recognizable as a living plant. think I'm addicted... But then again my succes rate of getting these little wonders to grow into something edible on my kitchen counter is such that I do actually need this back up of surplus seedlings. ( Altough practice makes perfect does apply). Then again there is always the added joy of giving away that which turns out to be surplus to me to a greatful receiver who did not heed the mantra!